~ Musings of a psychopathic alcoholic, raconteurs, film buff, and more! I’m on the Astronaut Diet: I eat nothing but Dippin’ Dots and Moon Pies. I prefer Critters to Gremlins. I’ve dumped a girl for not liking the song “Motown Philly“. I write most of these reviews while drunk. I stole the cookie from the cookie jar. Everything that I know about classic literature I learned from a Jack Russel Terrier named Wishbone. Remember to check us out on Facebook and Twitter for updates and terrible jokes. If you share and like this over the various social media platforms I get to look at the page stats without shaking my head and switching over to whiskey for the rest of the day. Here’s the review. 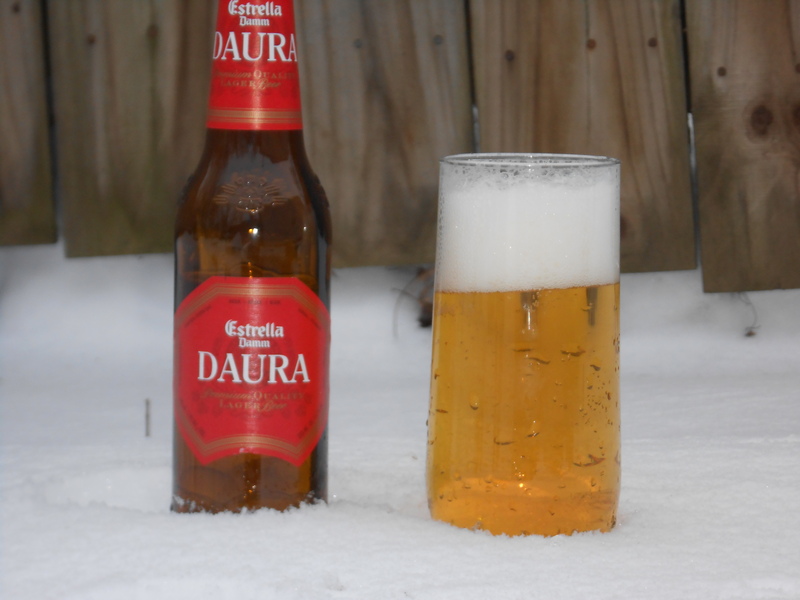 Appearance: I’m not a great fan of pale lagers, but this is one of the finest specimens that I’ve seen in a long while. The head alone would give this a perfect score on appearance. Strong, foamy, long-lasting and it laces wonderfully down the glass. I can only imagine that this is fueled by the energetic carbonation that’s tame enough to not be distracting. The beer itself has a fine color that lies somewhere between freshly cut straw and the hair of the blonde at the end of the bar. Perfect. Smell: A bit muted. Sweet corn, grass, and a touch of hops. I’m getting something fruity, but I can’t place it. Seems a bit off. Taste: A bit of a let down, really. The mouthfeel is fine; crisp, with a slightly-less-than-medium body. The actual taste is lacking in power and feels very generic. The sweet corn comes through in a nice way, but not much else does. I’d love to taste those hops, to get a bit of bitterness, to get something in the way of an aftertaste, but there’s not a lot going on here. Very boring. Overall: Appearances count for a lot with me, but taste is king when it comes to rating these beers. I’d normally give this a much lower score, but it scores a lot of aesthetic points. 68/100. Up Next: A nice IPA. I’ve already had it, so I know it’s good. I woke up this morning, from a very pleasant dream about the film Se7en, to the sounds of my cat, General Robert E. Flea, having a nightmare; this almost always happens if we have Italian the night before so I expected this. I gently picked him up and began rubbing the small of his back, the way a mother would encourage an infant to burp. At that very moment I noticed that my Victorian sleeping garments were covered in some sort of chlorine-scented ectoplasm, centered mostly around the region of my urinary meatus. It has a salty taste, reminiscent of the “mystery milk” that my grandfather weaned me on as an adolescent. He’s been dead for over a decade though. If you have experience with these sorts of hauntings please contact me immediately. I really want to get the recipe from that ghost. 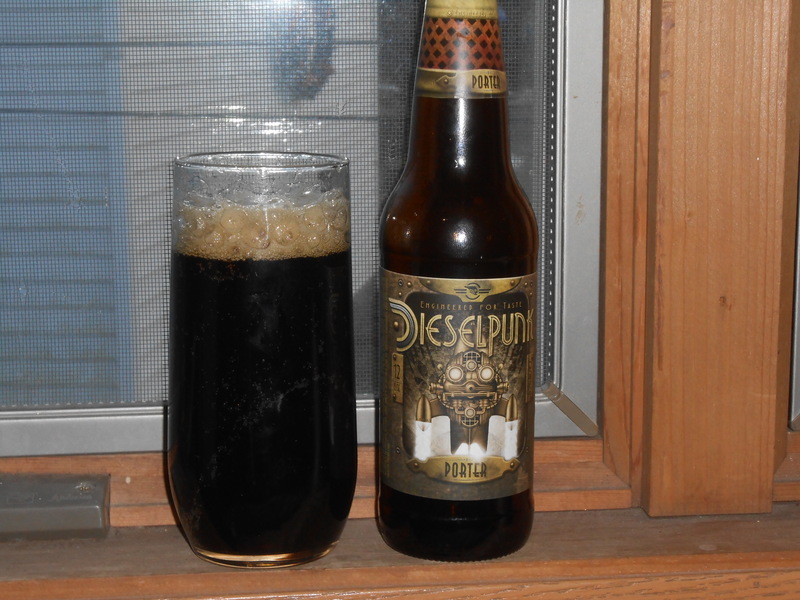 Here’s a Dieselpunk Porter review. Appearance: A dark, cola-like black that takes on a deep ruby color when held to the light. The head is full of energy and explodes in size, quickly trickling down to almost nothing. It’s quick to reform after a good swirl and does lace fairly well. Smell: Weak and sweet. There’s a very noticeable presence of freshly mowed grass and hops. You can also smell the alcohol coming off of it. Taste: Christ Almighty! That is not what I expected. I’m a fool for a good porter so I typically know what I’m getting in to when I get a new one to try. This drinks more like a Black IPA than a porter. Bitterness takes to the main stage here, backed up by a subtle, lingering, maple-like sweetness and strong carbonation. It’s quite crisp, which is unexpected given its slightly-thicker-than-medium body. Its seriously lacking in the traditional porter tastes though. Overall: If this was labeled as a Black IPA I’d happily give it somewhere between an 80 to 85. As a porter though, it gets a 71. This is a decent beer, one that wouldn’t be bad in the right situation, but it’s not what was promised. I’m giving bonus points for the graphic design on the bottle too. I shouldn’t, but it is a pretty bottle. Up Next: Probably something awful.